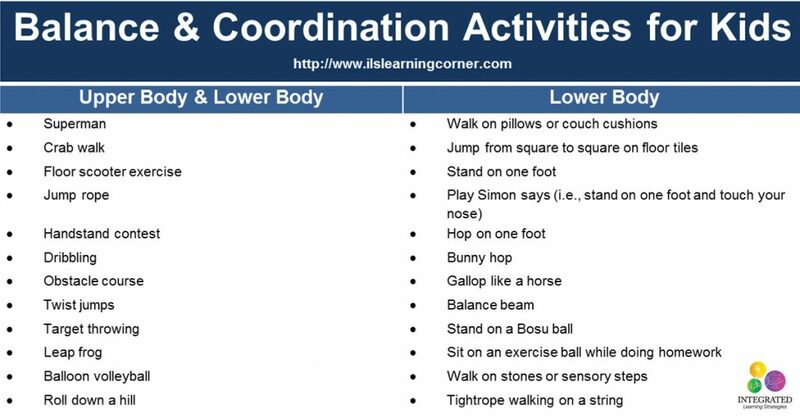 This article provides helpful information for children who need balance and coordination activities for better attention and focus in the classroom. Affiliate links are included for your convenience. Integrated Learning Strategies (ILS) is a learning and academic center. As a reminder, ILS is not a health care provider and none of our materials or services provide a diagnosis or treatment of a specific condition or learning challenge you may see in your child or student. If you seek a diagnosis or treatment for your child or student, please contact a trained professional who can provide an evaluation of the child. Developing balance and coordination begins almost at birth. 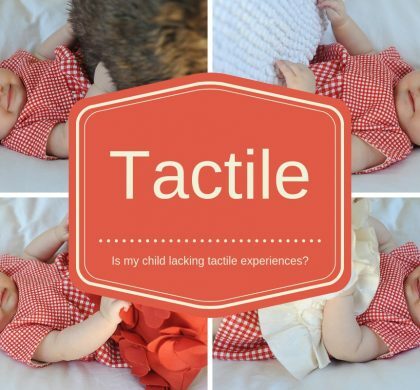 As babies develop, they learn to lift their head, roll over and scoot across the floor. Eventually, when babies turn into toddlers, their balance and coordination develops more quickly as they begin to crawl, walk, skip, jump and run. During these developmental stages, children typically become involved in more complex and difficult activities on the playground and at home that help them in their growth and development. However, when a child has developmental delays and fails to improve their balance and coordination skills overtime, they may experience gaps in learning. Many parents don’t always understand how balance and coordination is connected to their child’s learning process. Most of these skills come naturally for many children, but for those that fall behind, it can have a direct impact in the classroom. 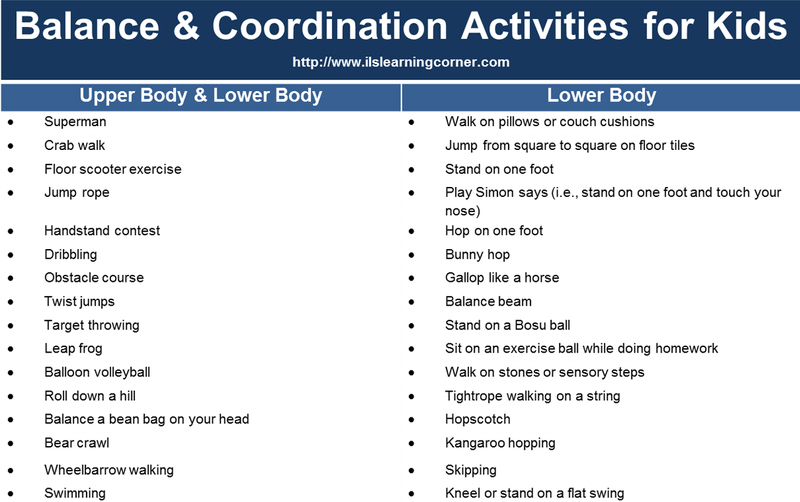 Children that experience trouble with body awareness, balance and coordination, crossing the midline and core muscle tend to struggle with focus and attention in school. Because balance is a fundamental tool needed for controlled positions, such as sitting in a chair, children tend to have trouble focusing on academic tasks when these skills are not properly developed. With these students, we often see more fidgeting, poor posture and lack of fact retention as they listen to the teacher. Many times the teacher or parent has a difficult time giving the child instructions or directions and has to repeat themselves before tasks are completed. The child has to focus so much on keeping their body calm and “still” while sitting at their desk, that their brain doesn’t have the “space” available for learning. 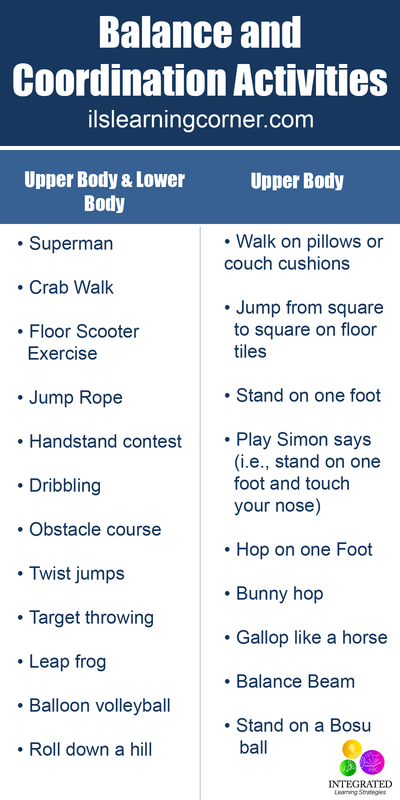 When children are engaged in games and activities that promote better balance and coordination, their bodies learn to focus faster and more efficiently. If your child can develop the mental energy to control their balance and coordination automatically without having to think about it, they can then free up their brain for processing information, listening to the teacher and focusing on higher learning concepts.